A few weeks ago I gave the shortest yet most personal and powerful keynote: I got on stage in front of 500 leaders and told them about the biggest mistake I’d been making as a leader for the previous 15 years. This mistake almost cost me my company -- and my family and health -- but after an excruciatingly difficult and incredibly rewarding journey, I’d learned the lesson I am so passionate to share with as many leaders, entrepreneurs, executives, and humans as I can. In 2012 Google embarked on an initiative to determine what makes the most effective team -- they wanted to learn why some teams performed so much better than others. The answer surprised everyone: psychological safety. The number one factor in determining whether a team was effective and successful didn’t have to do with who was on the team, how much money they made, or what education they’d gotten. But it had a lot to do with psychological safety, which refers to an individual’s belief that a team is safe for taking risks. Psychological safety means that you don’t fear being embarrassed or judged when you come to your team and offer a new idea. It also means that you can openly share how you feel, including when you’re struggling with something at work or in your personal life. The top factor that determined a team’s success at Google was whether members of the team felt safe to be themselves and express themselves honestly to their teammates. Do you feel this way about your team at work? As a leader, do you feel that your teams function this way? But more importantly, do you spent time focusing on how to cultivate psychological safety within your team? Psychological safety is just one example of how the emotional health of your team directly affects the ability of every team member to be productive, innovative, and creative. And it’s just one component of what you must cultivate within your team if you want to be successful: a human-centered culture that helps employees and teams thrive. It’s the emotional wellbeing of your team and it’s the greatest unrealized asset you have. There is a growing mountain of research that shows how improving emotional wellbeing and happiness of your employees increases everything from their productivity to your company’s profits. Happiest employees spend 46% more time on their tasks and report being 65% more energized by their work. Studies show that employees have many more new ideas and get more done when they feel happier. Employees who are happier help their colleagues 33% more often than their less happy counterparts. Happiness correlates with being engaged in their work and companies with more engaged employees have twice the earnings and three times the profit of their counterparts. Happier employees take 10 times less sick leave than those who aren’t happy. 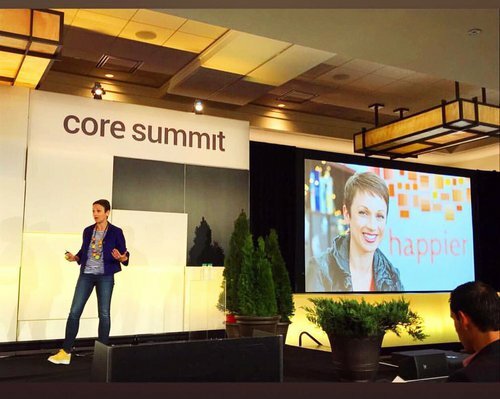 About a year ago we launched an innovative Happier @ Work Program to bring our science backed skills to companies to help strengthen the emotional health of their employees and improve team culture. As I’ve talked to many leaders about this program, I’ve been surprised at how many still think of culture and emotional wellbeing of employees as “soft stuff”, an extra, a bonus, a cherry on top (or, worse, nothing they or their company really needs to worry about). It sounds ridiculous (I hope), but if you’re really honest as a leader, do you truly prioritize investing your energy, time, and money into teaching your employees emotional wellbeing skills and cultivating a human-centered culture that will help them do their very best work? The research not only shows that happiness and culture aren’t “extra” -- the consequences to your business for not having a strategy for them are significant. 1. Happiness isn’t about smiling and being positive all the time. The whole idea that happiness means always being positive is just wrong. True emotional wellbeing means you’re able to embrace all of your emotions, including the difficult ones, and that you have the tools to get through challenges and difficult times. In other words, true emotional wellbeing also includes resilience. 2. Happiness isn’t something you feel, it’s something you do. It’s a skill and like any skill you can improve it through practice. Research shows that only about 50% of our happiness is genetically determined (our so-called “happiness setpoint", which differs for all of us.) That means that the other 50% is within our control and if we approach emotional wellbeing as a skill, we give ourselves and our employees the best shot at improving it through practice. And here’s the best news: You, as a leader, have an outsized impact on the happiness and emotional wellbeing of your employees. You can help teach your team members the skills to improve their emotional wellbeing simply by modeling them yourself. Do you ever feel that you’re in a fishbowl and all of your employees are watching you? They are. You set the tone and your behavior sets an example what you want them to do. But this is also difficult news because often, as leaders, what we do, from our very best intentions to cultivate a great, positive team culture, is the thing that hurts it, instead. I’ve been a leader for 20 years and an entrepreneur for 15. It is so hard. It can feel lonely. Overwhelming. Stressful. Anxiety-filled. But I always thought that as a leader, my job was to cover up any feeling of self-doubt, uncertainty, overwhelm or stress. I thought good leaders were always strong, positive, and confident -- and I tried to act the part as much as I could. What’s more, my own fear of sharing “negative” emotions with my team members led to fear any time any of them did. So I tried to take on as much of their stress as I could, thinking I could just absorb it and relieve them in the process. Eventually, slowly and suddenly, I reached a breaking point. I could no longer pretend or squash my feelings of overwhelm or self-doubt -- the ones I’d experienced while running a startup but also the entire pile of them I’d collected from the time I came to the US as a refugee at 13 and believed that if I were to ever reach my American Dream of being happy, I had to never, ever allow myself to feel anything but positive. Reaching a breaking point was so scary. I felt only dread and while I was going through the motions, at work and with my family, I was slowly becoming just a shadow of myself. I felt hopeless for the first time in my life and I didn’t know what to do. It was the darkest time in my life. But with the help of an unexpected teacher, and more importantly, by opening up to thinking about my emotional health in a fundamentally different way -- not as an extra, but as the foundation for doing everything I wanted as a leader and a human being -- I found a different path. It took several years of the hardest work I’d ever done, but I am grateful for getting to the brink so I was open to taking it. One of the most difficult realizations was that ignoring my emotional health had significantly hurt members of my teams at work. It turned out, I wasn’t actually hiding my emotions and overwhelm from anyone. My team members could feel that I was on the brink and they dealt with it by trying to avoid telling me anything that might further stress me out -- including challenging my suggestions that weren’t right or sharing constructive feedback about product features that would have prevented us from wasting a lot of time and money. In my attempt to shelter my team from my “negative” feelings, I’d created the worst of both worlds: I wasn’t honest about my feelings and the team wasn’t honest with me. Whatever the opposite of psychological safety, that’s what I cultivated within my team -- and it began from my best intentions, but ones that were misinformed and misguided. You’re not a great leader if you’re suffering. But you can be a great leader if you become more honest about how you feel and open up about it to your team. When you do that, you will be helping them, as much as yourself, and you’ll be taking a big step towards unleashing your greatest unrealized asset -- the emotional wellbeing of your team. Become a little more honest about stuff you’re dealing with. First with yourself and then, by sharing a bit more with your team members. Be the leader who cultivates psychological safety by modeling that it’s OK to talk about not always feeling great and sharing your struggles, big and small. Recognize that being happier doesn’t mean always smiling and being positive. It’s not about faking it til you make it. It’s not about covering up your “difficult feelings”. Model to your team that improving your emotional wellbeing also means learning to be more resilient during challenges we all inevitably face. And remember that resilience begins with accepting and acknowledging that you’re a human being, who has a variety of emotions, that your team members do too, and that it’s not just OK to talk about them but it’s non-negotiable if you want to succeed. This is a powerful place to start.